Iranian stockbrokers monitor share prices at the Tehran Stock Exchange in April. The historical Iran nuclear deal could open the country's market up to international investors. "I'm in my office. I have emails overflowing with interest from people all around the world that have heard the news," he says. Rabii's job with Iranian firm Firouzeh Asia Brokerage is to drum up international interest in Iran's stock market. He says there's more substance there than outsiders might expect. 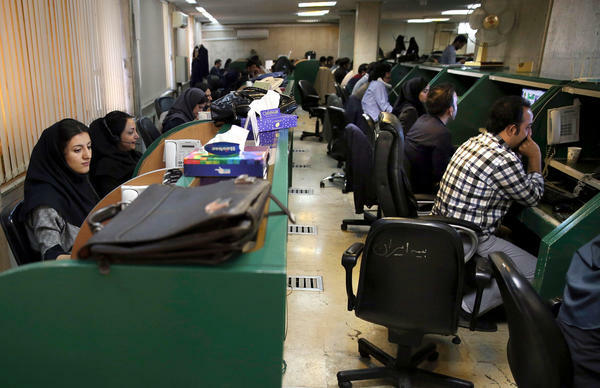 "The Iranian stock market is a well-diversified exchange. There are 35, 36 different sectors," says Rabii. They include chemicals, banking, base metals, industrial holdings, telecommunications, oil products and more. It's that diversity and potential that intrigues Charlie Robertson, London-based chief economist with Renaissance Capital, an investment bank specializing in emerging markets. "I think the first phase of the investor looking at Iran is, wow, 80 million people as educated as Turkey, GDP bigger than South Africa, suddenly available," he says. Robertson visited Iran last year and says it's developed and sophisticated in ways he never expected. "I strongly recommend considering a visit to this country. It really surprised me," Robertson says. "I've never seen as much plastic surgery on the streets in a day as I did in Tehran." Even though he's enthusiastic about Iran, Robertson says some trouble there is unavoidable. "So people will just come in and buy. And then they'll discover the problems," he says. "Perhaps it will take a year, maybe 18 months. But the problems of who does own this, does the Revolutionary Guard play perhaps too significant a role?" To Michael Rubin of the American Enterprise Institute, the answer is a definite yes. In fact, he says, the Islamic Revolutionary Guard Corps is "the chief investor in the Iranian stock exchange." The Revolutionary Guard Corps is Iran's elite military and security force, and Rubin says it also controls a significant portion of the country's economy. He says that makes investing in Iran a dangerous business. "Frankly, if anyone walks into Iran and wants to invest — if they're naive about it — they're going to get burned to a crisp," Rubin says. There are more mundane matters that will make foreign investors cautious about Iran. Many financial institutions in Iran are cut off from the network used for global banking transactions. The lack of transparency and financial disclosure are major issues, says Reza Yeganehshakib, an Iran expert with Corr Analytics, a U.S.-based political risk consultancy. He says even if sanctions are lifted, Iran's stock market has plenty of work to do. It will have to translate financial statements into English, adopt investor protection rules, and more. When that happens, Renaissance Capital's Robertson says he knows some adventurous souls who will take the plunge. "They think it's a huge opportunity, and perhaps the last big opportunity you'll ever see of a country this large, this sophisticated becoming available to any investor," he says. Robertson says Iran's capital markets could open to the world relatively quickly if the nuclear sanctions are lifted — as early as next spring. Other U.S. sanctions against Iran would remain in place. A senior Obama administration official says U.S. individuals and banks will still generally be prohibited from investing in Iran. Iran isn't known for its fondness of Western-style capitalism, but it does have a stock market where shares in Iranian companies are traded. And if sanctions are lifted following the nuclear deal, that market could be where international investors put Iran's economy to a road test. NPR's Uri Berliner reports. URI BERLINER, BYLINE: The nuclear deal had just been announced earlier in the day, and Radman Rabii was in Tehran, excited about the future. RADMAN RABII: I am in my office. I have emails overflowing with interest from people all around the world that have heard the news. BERLINER: It's Rabii's job to drum up international interest in Iran's stock market for an Iranian firm, Firouzeh Asia Brokerage. He says there's more substance there than outsiders might expect. BERLINER: And more. It's that diversity and potential that intrigues Charlie Robertson. He's chief economist with Renaissance Capital, an investment bank specializing in emerging markets. CHARLIE ROBERTSON: I think the first phase of the investor looking at Iran is - wow, 18 million people as educated as Turkey, GDP bigger than South Africa - suddenly available. BERLINER: Robertson visited Iran last year and says it's developed and sophisticated in ways he never expected. ROBERTSON: I strongly recommend considering a visit to this country. It really surprised me. I've never seen as much plastic surgery on the streets in a day as I did in Tehran. BERLINER: Even though he's enthusiastic about Iran, Robertson says some trouble there is unavoidable. ROBERTSON: Some people just come in and buy, and then they'll discover the problems. Perhaps it'll take a year - maybe 18 months - but the problems of who does own this, does the Revolutionary Guard play perhaps too significant a role. BERLINER: To Michael Rubin of the American Enterprise Institute, the answer is a definite yes. MICHAEL RUBIN: The chief investor in the Iranian stock exchange is the Islamic Revolutionary Guard Corps. BERLINER: The Revolutionary Guard Corps is Iran's elite military and security force. Rubin says it also controls a significant portion of the country's economy. And he says that makes investing in Iran a dangerous business. RUBIN: Frankly, if anyone walks into Iran and wants to invest - if they're naive about it, they're going to get burnt to a crisp. BERLINER: There are more mundane matters that will make foreign investors cautious about Iran. Many financial institutions in Iran are cut off from the network used for global banking transactions. REZA YEGANEHSHAKIB: The issue is the lack of transparency and financial disclosure. BERLINER: Reza Yeganehshakib is an Iran expert with Corr Analytics. He says even if sanctions are rolled back, Iran's stock market has plenty of work to do. It will have to translate financial statements into English, adopt investor protection rules and more. When that happens, Charlie Robertson of Renaissance Capital says he knows some adventurous souls who will take the plunge. ROBERTSON: And they think it's a huge opportunity, and perhaps the last big opportunity you'll ever see of a country this large, this sophisticated suddenly becoming available to any investor. BERLINER: Robertson says Iran's capital markets could open to the world relatively quickly if the nuclear sanctions are lifted - maybe as early as next spring, but not for Americans. Other U.S. sanctions against Iran would remain in place. A senior Obama administration official says U.S. individuals and banks will still generally be prohibited from investing in Iran. Uri Berliner, NPR News. Transcript provided by NPR, Copyright NPR.